In 1818, young author Mary Wollstonecraft Shelley introduced the world to a new type of monster: one that was created by a scientist in his pursuit of the secrets of nature. Her novel, Frankenstein or The Modern Prometheus, told the tale of a young man named Victor Frankenstein whose scientific studies revealed to him a method of bestowing life on inanimate matter. He immediately set out to test this in the most spectacular way possible: by creating his own human being from parts of dead bodies. But Frankenstein was so enthusiastic to see his work completed that he didn’t give a thought to the actual appearance of the creature until it had already been brought to life; only then did the scientist realize how physically imperfect and hideous a being he had created. Frankenstein fled in horror from his own creation. 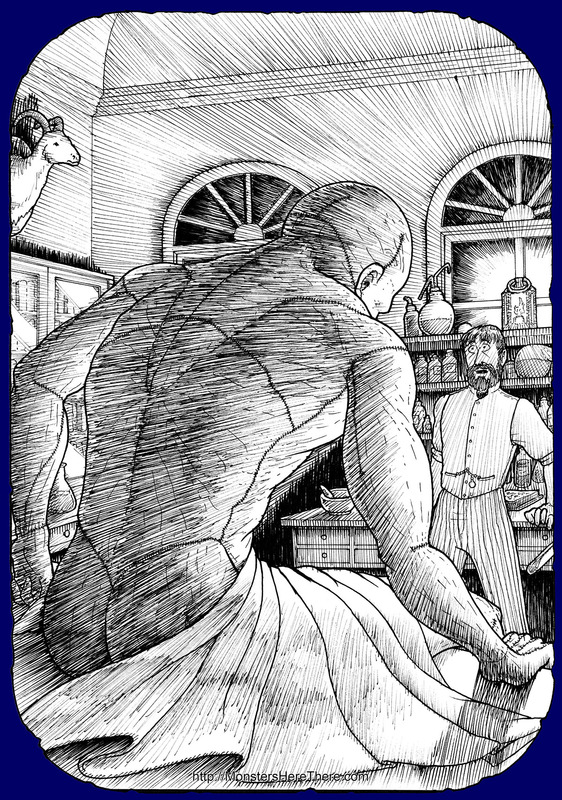 Nearly two years after Frankenstein’s experiment, the scientist finally found himself face to face with his creation; but instead of attacking his creator, the monster demanded a favor. He wished Frankenstein to create a female creature, a companion that would not reject him as a monster, for she would be one too. The monster promised that if Frankenstein did this, he would take his bride and vanish from the realm of humans forever; and if not, then Victor and all he loved would be destroyed. At first, Frankenstein agreed to create this second being; but he was soon filled with dread that a second monster would only be a further blight against humanity, and so destroyed his new creation. The monster responded by killing Frankenstein’s wife on their wedding night, leaving both the scientist and his creation with nothing to live for but revenge on one another. Shelley’s novel was a pioneering work in both horror and science fiction that clearly voiced many of the then-current fears of the progress of scientists on discovering the secrets of nature and the universe. The word ‘Frankenstein’ soon came to be used to describe anything that became unexpectedly uncontrollable or monstrous. In the novel Shelley never fully described the monster. The only details she gave were that he was about eight feet tall, had yellowish eyes and skin, and that his hands had a mummy-like appearance... other than that, she left the monster’s appearance up to the reader’s imagination. But this approach couldn’t be taken for the movie, so makeup artists created what has become an instantly recognizable creature. Actor Boris Karloff was given scars where the monster’s body had been stitched together, metal bolts on his neck so electricity could awaken the monster, and half-closed eyes to give him a far-away look. But most notably the monster was given a square head, as if its creator wanted an easy open-and-close top on the creature’s cranium to put the brain in. In the movie, Frankenstein’s monster never becomes as eloquent in his ability to communicate as the creature in the novel, but, like the novel, the monster is driven to be bad both by poor treatment and a lack of care from his creator. Frankenstein’s monster has become one of the most recognized and well-known of all fictional monsters worldwide. Part of the story’s extreme fame, naturally, comes from both the idea of creating new life and the idea of bringing the dead back to life. These are magical attributes that in myths and legends have been respected and feared for centuries. To spawn life where there is none is usually considered to be either a divine power bestowed by the supernatural world, or an arrogant presumption of power made by a bold human... and in the second case, this arrogance is usually met with disastrous results. For example, a well-known legend in the Czech Republic is told of a Golem ― a man made from clay and animated by divine magic ― that was created to help people, but suddenly went berserk in the city of Prague in the late 1500’s. Frankenstein’s scientific creation of his monster is clearly an example of this arrogant approach to life and resurrection, but there is one major difference between the older legends and Mary Shelley’s novel. In the older legends, the creatures were meant to be slaves, and had no ability to think or reason on their own... but Frankenstein created a creature that was in every mental way a equal to human beings, and fully capable of learning to make its own decisions. In short, Frankenstein’s relation to his monster is not that of a master to a slave, but of a parent to a child... and, both in Shelley’s novel and the 1931 movie, Frankenstein was a bad parent. So, though the monster makes its own decision to be evil, Frankenstein himself is just as much to blame. I believe it is this aspect of Mary Shelley’s novel, as an example and warning to parents, that has given the story a timeless quality and has spread it across the world to many different places and cultures. Frankenstein or The Modern Prometheus, by Mary Wollstonecraft Shelley, 1922 Cornhill Publishing Company, Boston, New York, USA. Read online: Click Here! Frankenstein (movie), directed by James Whale, starring Boris Karloff as the monster, 1931 USA. Watch the original movie trailer online... Click Here!